After security, the notion of privacy is the most debated topic in the online world, especially in recent years, with the rapid and aggressive proliferation of social networks and mobile computing. Microsoft also got into the crosshairs of public scrutiny, especially with the release of Windows 10 and its supposedly questionable practice of collecting user data, more technically known as telemetry. While I personally believe the subject to be blown out of proportion, just like computer security, I do understand why it's so important to so many people. Ignorance breeds fear, and fear leads to paranoia. Of course, IT companies are not helping with their casual attitude to using and abusing user data. 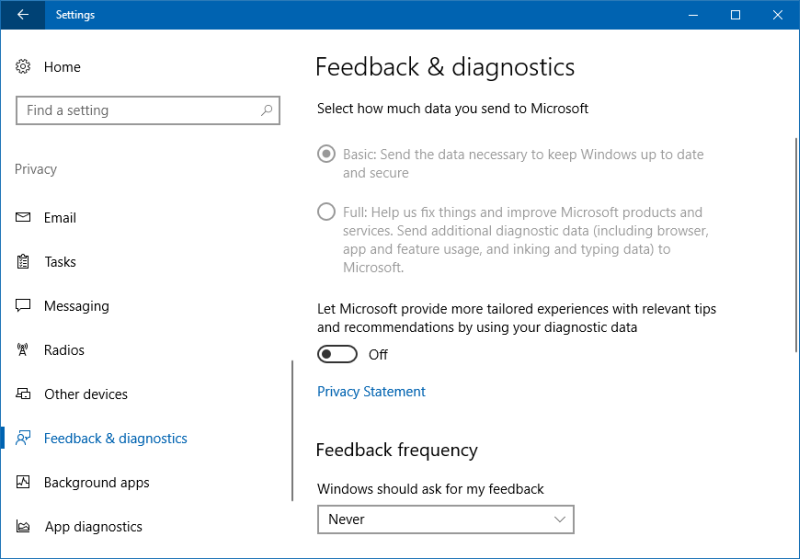 Microsoft realized that this be a slippery slope, and so they made a change - Windows 10 now comes with far more information and transparency regarding the data collection practices. Let's talk. Before we begin, let's make sure we're on the same frequency. I use Windows 10 with a local account, as I see little value in an online account on the desktop. I also detest the IQ < 100 default settings in the system, which is why I tamed Windows 10 into submission, as I've underlined in my detailed article on Windows 10 privacy. I've done these things not because I don't want Microsoft to know my particular taste in adult entertainment or my nonexistent list of friend contacts, it is because I like things to be simple and quiet, and the operating system should not change in between updates or stand in the way of productivity and efficiency. The privacy aspect is secondary here. If you follow my model - let's call it the classic desktop approach - then you already have a significantly reduced vector of exposure to any tracking that may be. For instance, Cortana does not work with the local account, and many other things have limited functionality, too. Which is fine. If you're wondering or questioning my motives, please remember I do use a Lumia 950 phone with WP10, and it's a great thing. The major problem we have is that Microsoft decided to force the thumb-happy chimp usage model from the touch world onto the super-fast, multi-task reality of the desktop, and the two shalt never meet. Now, let's see what we have here. I let my Windows 10 test unit update itself, rebooted. And then ... nothing much really. 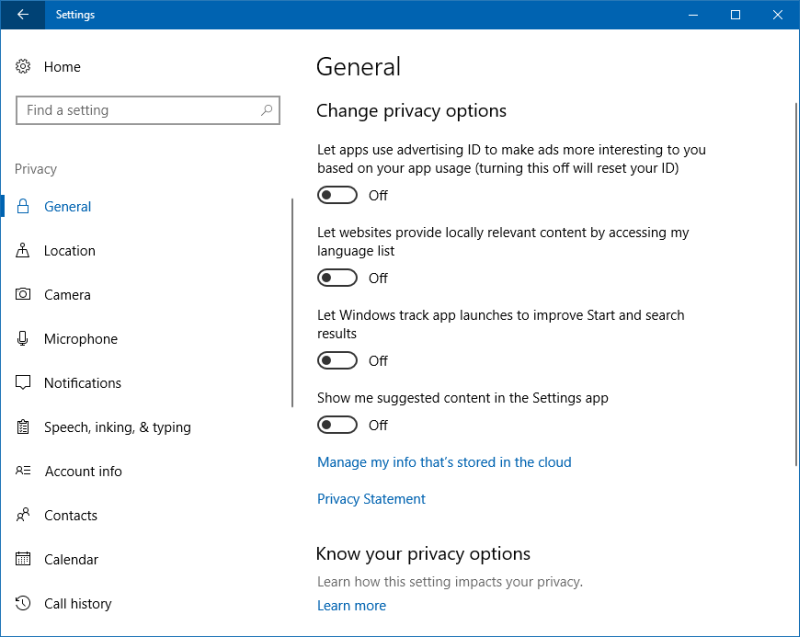 The changes in privacy settings and their visibility will mostly impact new users, and people just moving into the Creators Fall update. If you're already set, things ought to stay the same. Indeed, I checked all the checkboxes and services, and nothing has been "accidentally" turned back on. The radio buttons are grayed out because 1) I'm using a limited (and local) account, and I've launched the Settings menu without administrative privileges 2) the gloriously named tracking service (Connected User Experiences and Telemetry) is turned off, and there's no data collection, be it basic or full. 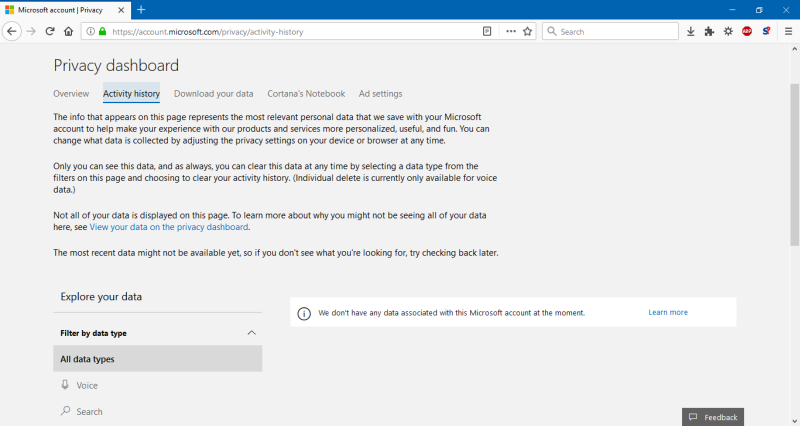 If you do want to check what data Microsoft has already collected from your devices/account, and/or make changes, then you have the option to do so on the General tab under the Privacy page in the Settings menu. Click on Manage my info that's stored in the cloud. BTW, that's a badly phrased sentence, but never mind that. This will open a browser. Log in with your Microsoft account. If you have never created any, you're all set. There will be no data. In the browser, there's a wealth of information, explanations, clarifications, and options. Very commendable, I have to say. I know people always instantly assume malicious intent, conspiracies and whatnot, and they are wondering what Microsoft is hiding, but the simple reality is, you get a readable, usable dashboard that gives you more control than any other cloud competitor. 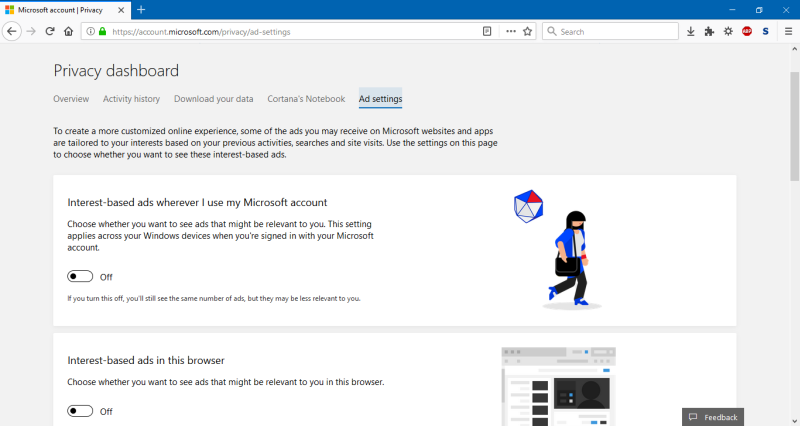 As I said, the combo of using a local account - although I do have a test Microsoft account - plus the use of my privacy settings means there's nothing in the cloud. In the dashboard, under Activity history, you can explore your stored data. All of it, or by type if you want, and then you can chose to selectively delete whatever you deem too sensitive to remain online. 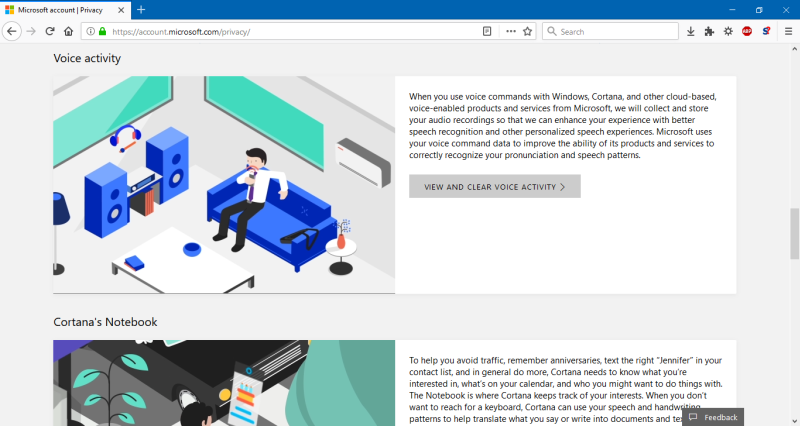 Cortana gets its own section. You can also separately tweak ads settings. This only affects Edge, to the best of my understanding. But either way, the options are there, and it does not hurt to check and change as necessary. All of this is very straightforward and very friendly. 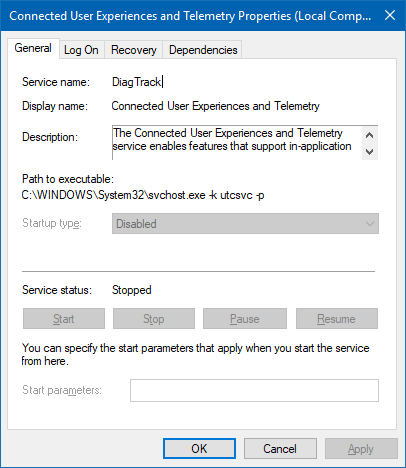 Perhaps the usage model is a little bit clunky, in that you need to go online to make changes, but I guess that could also be due to the nature of my setup, and also as a possible security precaution. In general, I found no sinister or hidden settings that should make me suspect anything or tickle my worry glands. Should you trust Microsoft? The answer is very simple - if you do not, do not use its products. This is true for every provider of everything out there, and there are no two ways about it. 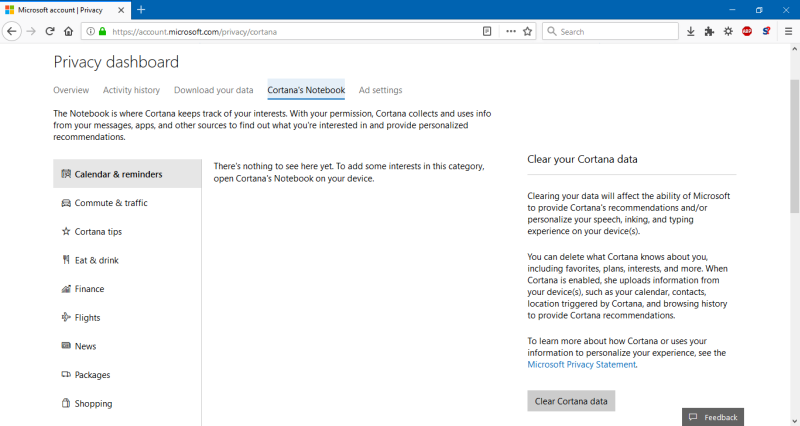 With this privacy dashboard, Microsoft has actually taken an extra step in trying to assuage fears around its data collection policies. You also have long and detailed documentation that lists every single data type, if you're interested, but that's just nerd music, and no sane person will read those. Again, there's nothing evil there. The problem is, people equate quality with their emotions. Windows 10 is not a bad system because it spies on your nefarious activities. It's bad (so to speak) because it tries to break the rules of physics, and it ships with an incomplete UI that is slowly, incrementally being worked on using a rapid-release cycle AKA Agile nonsense that is meant to make you feel all industrious and whatnot, but this has nothing to do with privacy. Alas, people seem to bundle everything together. Hopefully, the privacy dashboard should help some, but the way I see it, it will make conspiracy lovers even more suspicious, and the majority of people don't care either way. Still, Microsoft did the best they could on their end, and that counts for a lot. You can only - and should always - do your best. This is a step in the right direction. Perhaps in five years, Windows 10 will be a complete, fully baked product. Golly. From my end, it's usable enough, I have the tools to make it not interfere with my work, and its Exploit Protection feature is a blast. The rest is just buzzwords.